John Dolibois speaks to a crowd at Miami University. UPDATE 5/09/14: Miami University says a public memorial will be held at 11 a.m. Saturday, May 24, in the Oxford Presbyterian Church. Former United States Ambassador John Dolibois has died. 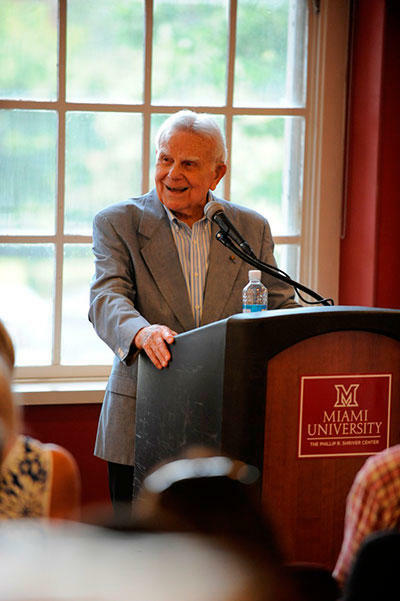 The Miami University graduate was 95. Dolibois was born in Luxembourg and emigrated to the United States in 1931. He graduated from Miami University in 1942 and was fundamental in creating the school's Luxembourg campus which was later named in his honor. During World War II, Dolibois was drafted into the service and wound up in Military Intelligence. Since he was fluent in English, French, and German he worked as an interrogator in the Nazi war crimes trials. He was the last survivor of a team that interrogated top-ranking Nazis for the Nuremberg Trials. In March 1945 Dolibois became a member of the five-member Army Intelligence team that interrogated the highest-ranking Nazi war criminals after the fall of the Third Reich, leading up to the Nuremberg War Crimes Trials. This included Hermann Goering, credited as the architect of the Nazi industrial machine and second in command under Adolph Hitler. After six months of interaction, he knew some of Hitler’s most trusted and senior-deputies well. When the defendants went to Nuremberg, Dolibois followed, interpreting their responses to Rorschach inkblot tests given by an Army psychiatrist. Prior to being drafted, he took a job at Procter & Gamble as an industrial engineer. He returned to P&G briefly after returning from the war. He then went on to become Miami's first full-time alumni secretary. He later became the first director of alumni affairs and development and, in 1966, first vice president for development and alumni affairs. In July 1981 he was named vice president for university relations, overseeing the news and publication offices as well as public relations, development and alumni programs. President Ronald Reagan chose Dolibois to serve as Ambassador to Luxembourg in 1981. He returned to Oxford, OH in 1985. In 2003, the U.S. Senate named the American embassy residence in Luxembourg the Dolibois House.